This pages outlines, in text, slideshow animation, and video formats, the steps performed to isolate genomic DNA from plant tissue. Plant tissue is harvested and placed in tubes or plates. The tissue is homogenized to separate the cells from each other. The plant cells and nuclei are lysed in the presence of an extraction buffer; the buffer contains salt and chemicals to help lyse the plant cells, stabilize the DNA, and reduce degradation. The DNA is purified from cellular debris and other molecules such as proteins. The DNA is precipitated by adding alcohol in the presence of salts. The DNA precipitate is collected and washed. The DNA is rehydrated in water or buffer solution. This video illustrates the basics of DNA extraction and gel electrophoresis in tomato. A transcript is available. Sherman, J and D. Quinn. 2007. 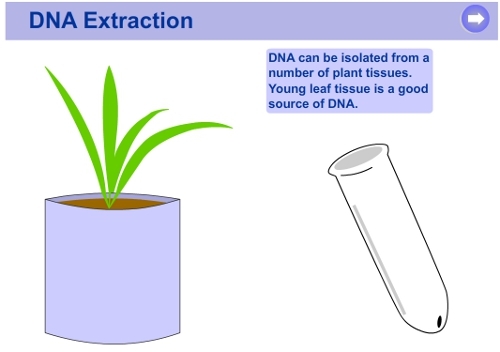 DNA extraction [Online animation]. Wheat CAP: Wheat Coordinated Agricultural Project. Available at: maswheat.ucdavis.edu/education/animations/anim_dna.htm (verified 11 May 2012). Wikipedia contributors. DNA extraction. Wikipedia, The Free Encyclopedia. Available at: http://en.wikipedia.org/w/index.php?title=DNA_extraction&oldid=382504443 (verified 11 May 2012).